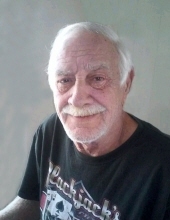 Celebrating the life of William "Bill" Demeri, Jr.
Obituary for William "Bill" Demeri, Jr.
William "Bill" Demeri, Jr. age 72, of Charleroi, formerly of McKeesport died February 3, 2019 at home. Born November 9, 1946 in McKeesport, he was the son of the late William and Margaret (Leighty) Demeri and the husband of Bonnie (Ectochin) Demeri. Earlier in life, Bill worked as a welder for Reliant Steel. He retired from Glenshire Woods as a nurses aid. He was an avid outdoors man, fishing in the Allegheny and Monongehla rivers and hunting in Somerset County. Bill loved spending time with his family playing card games and Yahtzee. In addition to his wife, he is survived by children, Eric (Danielle) Demeri of Level Green, Ruth (Chris) Simmons of McKeesport and Billiejo (William) Eastman of McKeesport; grandchildren, Nick Demeri, Chelsea & Melissa Adamson, Eric, Derek and Dionysios Eastman; siblings; Carmen (Lynne) Demeri of White Oak and Richard (Ellen) Demeri of Stowe Township; many nieces and nephews. Family and friends will be received at Willig Funeral Home & Crematory on Saturday, February 9, 2019, from 2 p.m. until time of service at 4 p.m. Pastor Jody Dausey will officiate. Condolences and memories may be shared at www.willigfuneralcremationservices.com . To send flowers or a remembrance gift to the family of William "Bill" Demeri, Jr., please visit our Tribute Store. "Email Address" would like to share the life celebration of William "Bill" Demeri, Jr.. Click on the "link" to go to share a favorite memory or leave a condolence message for the family.